Check out the hair job on these! As the snow melts and the bird's become more vocal,we or some of us feel an unrest surging in our veins! Knowing opening day is on it's way, makes me feel giddy .. I had written this poem last season and posted on another site, but figured wed give her a go here! Enjoy! First off my name is Matt Mitchell I'm 16 years old, I live in New Hampshire and am a beginning fly angler who is doing everything possible to learn more about the sport! 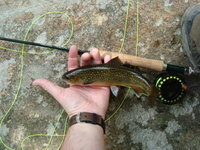 I love hockey, fishing, and hunting I started fooling around with the fly rod last year and caught a trout or two, but this year i am trying to actually learn the sport and make it my primary mode of fishing. I am joining this forum in hopes for some help on fly fishing and to learn and be apart of this fly fishing community!